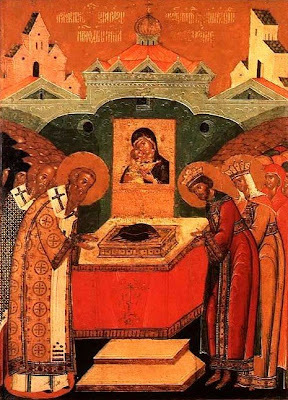 The Orthodox Church celebrates the Deposition of the Holy Robe of the Theotokos on July 2nd. Here is some information about the feast (from http://goarch.org/chapel/saints_view?contentid=187) and below this is a picture of the Holy Robe today (or possibly a portion of or one of numerous robes of the Theotokos), and how it came it rest in Georgia. It should be noted that this Sacred Robe of the Theotokos (Esthitos in Greek) is distinct from the Holy Belt or Sash of the Theotokos (Zoni in Greek). While the deposition of the Robe of the Theotokos is celebrated on July 2nd, that of her Holy Belt is celebrated on August 31st. A portion exists to this day in Vatopedi Monastery, Mount Athos. For more, see: http://full-of-grace-and-truth.blogspot.com/2009/06/holy-belt-zoni-of-theotokos-and.html. "During the reign of Leo the Great (457-474) two patricians and brethren on a pilgrimage to the Holy Land lodged with an old widow, a Christian of Jewish descent. Seeing the many miracles wrought at a small shrine in her house, they pressed her until she revealed to them that she had raiment of the most holy Theotokos kept in a small coffer. Our Lady had had two virgins in her lifetime who attended upon her; before her holy dormition, she gave each of them one of her divine garments as a blessing. This old widow was of the family of one of those two virgins, and it had come through the generations into her hands. With the permission of God, that this holy relic might be had for the profit of many, the two men took the garment by stealth and brought it to Blachernae near Constantinople, and building a church in honor of the Apostles Peter and Mark, they secretly enshrined the garment therein. But here again, because of the multitude of miracles that were worked, it became known to the Emperor Leo, and a magnificent church was built, as some say, by that same Leo, but according to others, by his predecessors Marcian and Pulcheria, and enlarged by Leo when the holy raiment was found. The Emperor Justin the Younger completed the church, which the Emperor Romanus IV Diogenes raised up immediately again after it had burned in 1070. It burned again in 1434, and from that time it remained a small house of prayer together with the renowned holy spring. After the seventh century, the name Blachernae was given to other churches and monasteries by their pious founders out of reverence for this famous church in Constantinople. In this church John Catacuzene was crowned in 1345; also, the Council against Acindynus, the follower of Barlaam, was convoked here (see the Second Sunday of the Great Fast)." "A history museum in Zugdidi (in western Georgia) has preserved many of the sacred artifacts confiscated from churches and monasteries at the beginning of the Soviet rule, from 1923 to 1936. Included among the artifacts is the Robe of the Most Holy Theotokos, which was brought there from the Dormition Monastery in Khobi (near Zugdidi). There are several different explanations as to how the Robe came to Georgia. According to one account, it was brought from Jerusalem at the beginning of the 12th century. According to another, it was brought to Georgia in the 8th century, during the period of iconoclasm in Byzantium. 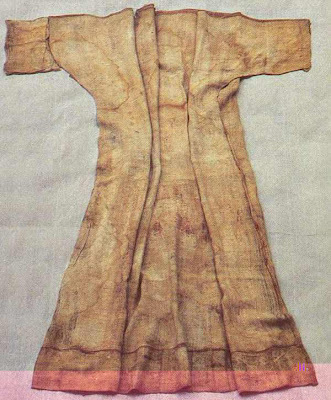 According to the chronicle Life of Kartli, the wonder-working Robe of the Most Holy Theotokos had been preserved in the church at Khobi for many centuries. In 1640 the Russian envoys Fedot Elchin and Pavel Zakharev visited western Georgia and reported having seen the Precious Robe. It was also described in the accounts of various travelers through western Georgia including Giuseppe Maria Zampi the Italian missionary, the patriarch of Alexandria (in the 17th century); and several monks of Mt. Athos. The Robe of the Theotokos was preserved in a silver case on the altar in Khobi, under the seals of both the catholicos and Prince Levan II Dadiani. According to tradition, many miracles have occurred and a great number of people have been healed by the wonder-working Robe. Every year on July 2, the Most Precious Robe is carried from the Zugdidi Museum to the Cathedral of the Blachernae Icon of the Theotokos. After the festal Liturgy the faithful joyfully venerate this most priceless treasure of the Christian Faith. Pilgrims from many countries have traveled to Zugdidi to venerate the Robe of the Most Holy Mother of God. For further information on the book THE LIVES OF THE GEORGIAN SAINTS by Archpriest Zakaria Machitadze contact St. Herman Press:St. Herman Press, P.O. Box 70, Platina, CA 96076 http://www.stherman.com/catalog/chapter_five/Lives_of_the_georgian_saints.htm"
O godly shelter that dost cover all mankind, the sacred robe that covered thy sacred body hast thou bestowed on all the faithful graciously, O pure Virgin, as a robe of divine incorruption. As we celebrate with love its august deposition, we cry to thee with fear, O graced of God: Rejoice, O modest one, boast of the Christian race. Most-Holy Theotokos, save us, help us, and protect us all! Amen! Why a beautiful explanation of the feast! We have a monastery here dedicated to Panagia Vlahernon. I've never seen a photograph of her robe. I will be linking to this post!